Thick brogues and lilting speech greet visitors to the city, traces of English, Irish, or Scottish roots. Foot stompin’ Irish music entertains into the wee hours of the night from the 75 or so pubs along George Street. Stop by this friendly city. 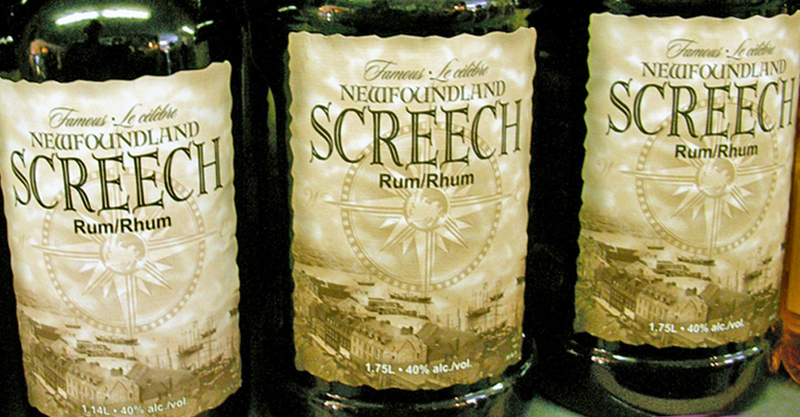 You may be offered some Screech and be inducted as an honorary Newfoundlander or uncover centuries of legends. As they say here, the world is made up of people who are Newfoundlanders and those who wish they were. Newfoundland’s first known settlers were descendents of Asians who migrated across the Bering Land Bridge over 7,000 years ago. The earliest Europeans were tenth century Viking explorers who stayed briefly. In 1497, John Cabot sailed his ship the Matthew for King Henry VII in search of spices. He reported that baskets thrown overboard were hauled back brimming with cod. Under charter by Queen Elizabeth to discover “remote heathen and barbarous lands”, Sir Humphrey Gilbert, half-brother of Sir Walter Raleigh, claimed the area for England in 1583. It became the British Empire’s first colony in North America. Of the approximately half million people who now live in Newfoundland, about 170,000 reside in the city of St. John’s. St. John’s is the oldest city in North America and the economic and cultural capital of Newfoundland and Labrador, which became Canada’s newest province after World War 2. St. John’s is a blend of old and new, city and nature. There are elegant historic homes, colorful wooden houses, brick and stone church and government buildings, colonial shops, and innovative modern museums. Should you want to tour by sea, regaled by songs and stories, accompanied by a Newfoundland dog, the Scademia sails past lighthouses and rugged cliffs to Cape Spear. We had just a day in port to see the best of the area and hired a local guide, Lucille Conway, who runs Heritage Tours. Lucille offered a wealth of information and local anecdotes. Stop at the Visitor Centre for an overview of the history of St. John’s. Stroll a trail, perhaps to Gibbet Hill—“hanging hill”—where, until the 19th century, bodies of criminals hung for 2 or 3 days before being rolled down in a barrel to Dead Man’s Port. On summer weekends, the Signal Hill Tattoo performs 19th century marching drills on O’Flaherty Field in Royal Newfoundland Regiment uniforms. 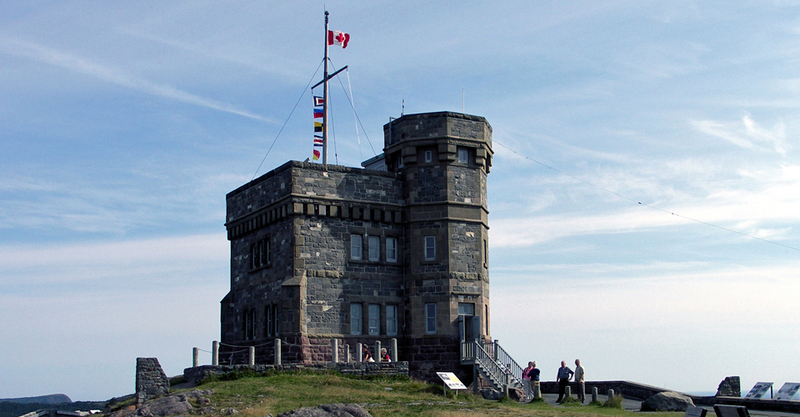 Topped with a high flying flag, and 500 feet above sea level, the landmark “castle”, Cabot Tower on Signal Hill is the area’s most visible attraction. It is worth the trip for the spectacular seaside views of the city and “the Narrows”, the rocky entrance to the harbor. There is a Marconi exhibit on the second floor. Since 1697, the British built fortifications on this strategic point, called “The Lookout”. Their 1762 victory in the final battle of the Seven Years War (French and Indian War) ended conflict with he French. “The Lookout” became known as Signal Hill. Military flags indicated the kind of ship approaching and its country of origin. Shots were fired to draw attention. Merchants had their own flags, hoisted by employees to signal workers to prepare to unload. Cabot Tower was built on Signal Hill in 1897 to commemorate the 400th anniversary of John Cabot’s voyage here and Queen Victoria’s Diamond Jubilee, celebrating the 60th year of her reign. Soon the area gained global attention. Guglielmo Marconi received the first Transatlantic wireless radio signal here in 1901. Charles Lindbergh reported sighting Cabot Tower as his last North American landmark during his solo flight to Paris in 1927. Amelia Earhart set off from St. John’s on her solo transatlantic journey in 1932. Newfoundland and Labrador are geological showcases—the most easily reached places on earth to find some of our planet’s earliest rocks. 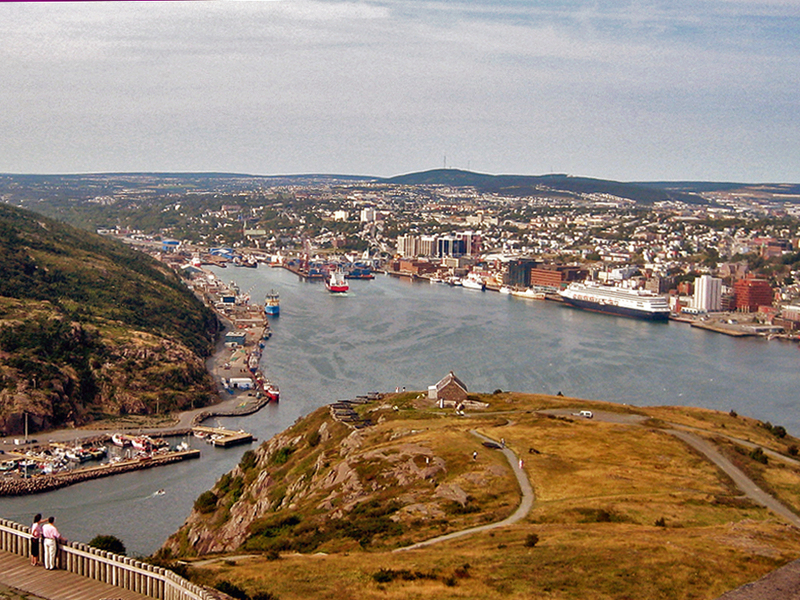 Those of Signal Hill are 550 million year old — from the time the continent of Avalonia drifted north. At the Johnson Geo Center visitors travel underground inside excavated rock walls and can touch pieces of prehistoric ocean floor or nearly 4 billion years old rocks from Labrador. Multimedia exhibits include the Titanic Story. Fifteen hundred lives were lost in the greatest peacetime tragedy of the 20th century when the luxurious ship hit an iceberg and sank 350 miles off Newfoundland’s coast. You can’t miss the three steep roofs that overlook the city and harbor. The Rooms are archives, a museum, and an art gallery designed in the style of “the rooms” in fishing communities where families came to process the catch. The Rooms are on the site of the star shaped citadel, Fort Townshend, one of North America’s largest British fortifications. King’s Bridge Road is where the elegant Victorian, Second Empire, and Gothic homes of the wealthy and elite were built in the 1890s. Jelly Bean Row, also known as Crayola Corner, is often photographed for its brightly-colored wooden houses. John the Baptist is the patron saint of Newfoundland, and two churches named for him are of particular interest. Anglican Cathedral of St. John the Baptist on Church Hill, near the Newfoundland Museum, is said to be the best example of Ecclesiastical Gothic style in North America. Inside are ornate wood furnishings and golden goblets given by patron King William IV. St. John the Baptist Basilica, with 150 ft. twin towers, seats 1500 and was built in Romanesque style in the mid-1800s for the Catholics from Ireland, then three-quarters of the city’s population. Designed in the shape of a cross of limestone and granite from Ireland, the Basilica is known for its religious sculptures and ornate ceiling. Also noteworthy is the Old Garrison Church, chapel for the garrison at nearby Fort William. The Hanoverian Coat of Arms is featured inside. 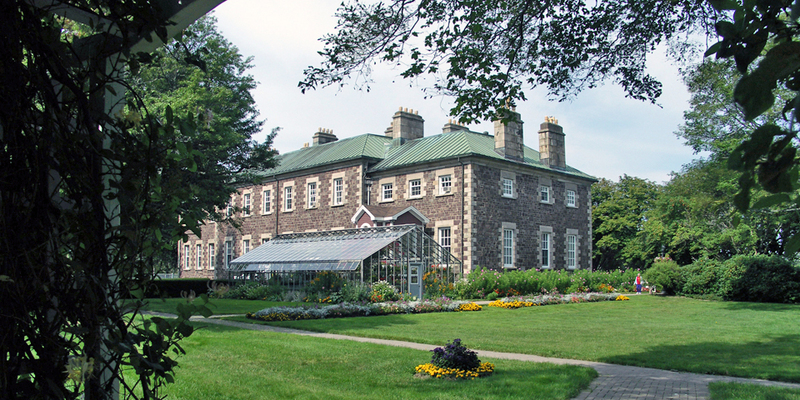 Government House, built 1827, is the residence of the Lieutenant Governor, Queen Elizabeth’s representative. A bedroom was redecorated with furniture designed and handcrafted by a local artisan for Prince Charles and Lady Diana’s visit celebrating Newfoundland’s 400th Anniversary of becoming a British colony. Beside Government House is the restored Commissariat House, 1821 home of the Commissary General. Serenity is but a couple of miles from city center. Stroll the botanical gardens, peek through a window at the Fluvarium, even spot a moose—all at Pippy Park. Stop for tea and scones at the tea room. Shoppers are drawn to the art galleries and handicrafts along Water Street, the oldest street in North America. “It was a thriving business district when Wall Street was just a swamp,” Lucille told us. Browse the shops for Newfoundland Labradorite jewelry, soapstone and wooden carvings, pottery, and landscape scenes. For locally produced hand-knitted products, stop by NONIA Handicrafts. An acronym for “Newfoundland Outpost Nursing and Industrial Association”, NONIA was founded in 1924 to raise funds for medical services in remote areas through the sale of hand-knitted and woven goods made at home by women of Newfoundland. Woof, also a cottage industry, gained fame for the rolled-neck fisherman-style Quoyle sweater worn by Kevin Spacey’s character in the movie The Shipping News. Also on Water Street, Velma’s Place is known for traditional Newfoundland food like fried cod tongues and fish and chips. This is where the New World began. It seems only fitting that St. John’s is mile zero of the Trans Canada Railroad. Nestled on a small protected harbor, just north of Signal Hill, Quidi Vidi (kidee videe) is a charming village in St. John’s with weathered buildings and fishing shanties. Guides in period uniforms tell colorful tales at the reconstructed barracks of the Battery. Quidi Vidi Lake is known for the annual Royal St. John’s Regatta, North America’s oldest continuing sporting event. Sample ales and lagers at Quidi Vidi brewery with names like the award-winning Erik’s Red, a cream ale brewed to celebrate Leif Eriksson’s arrival a millennium ago, or Iceberg, made from frozen glacial water off Newfoundland’s coast. 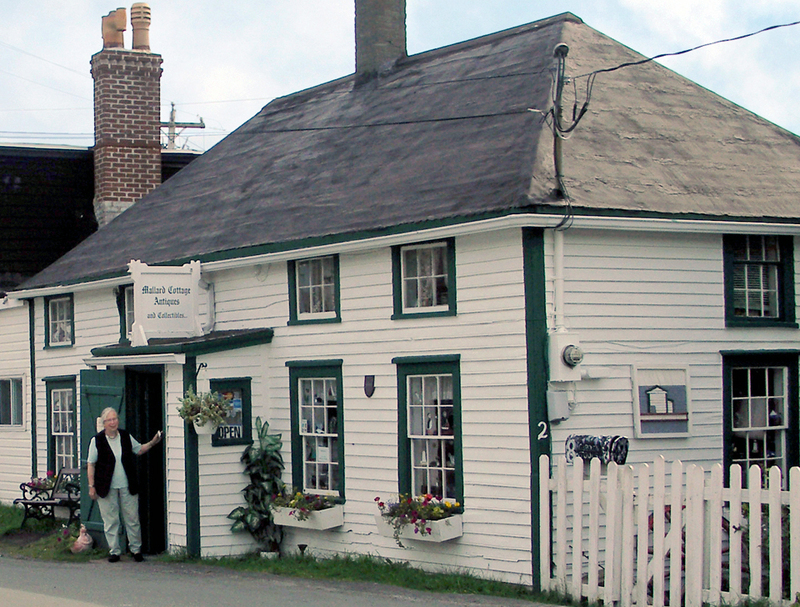 A jewel of the area is Mallard Cottage, the oldest structurally unchanged cottage in the oldest city in North America. The Mallard brothers, dairy farmers, joined other Irish immigrants in the area and built their home around 1750. Parcs Canada wanted an old Irish cottage for a film site and built a replica of this cottage outside Trinity in New Bonaventure. The film appeared on CBC in three two- hour sessions. Travel southeast for about 7 miles along a road built by Americans during World War II to the easternmost point in North America. You may spot a caribou, black bears, snowshoe Arctic hare—or one of Newfoundland’s 125,00 or so moose. 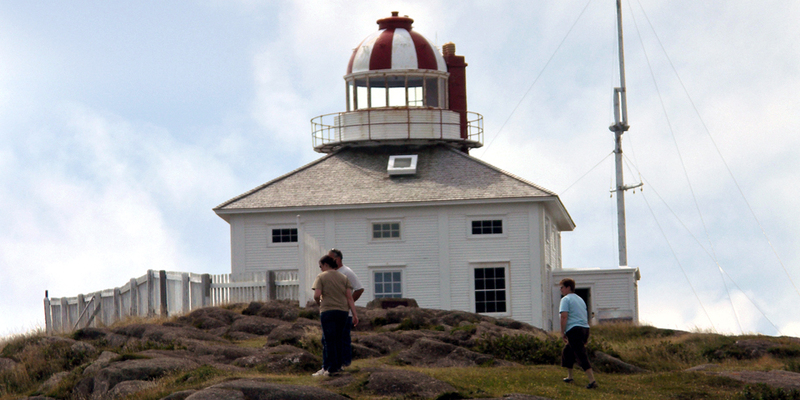 The Cape Spear Light, built in 1836, is the oldest existing lighthouse in Newfoundland, and now a lifestyle museum. The towering automated lighthouse was added in 1955. 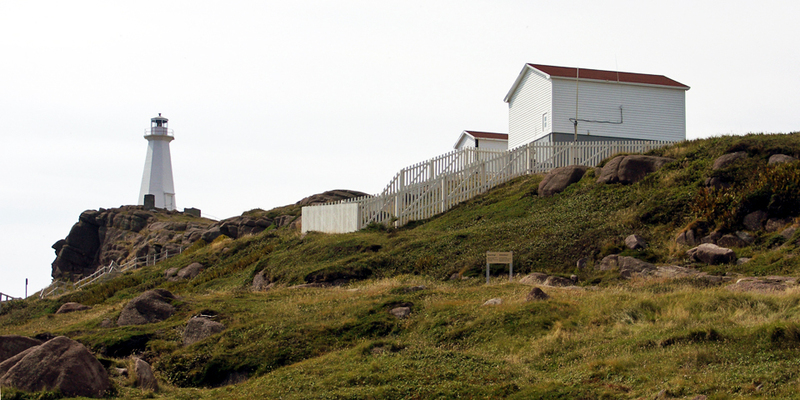 The Cantwells of Cape Spear have been keepers of these lighthouses for seven generations. 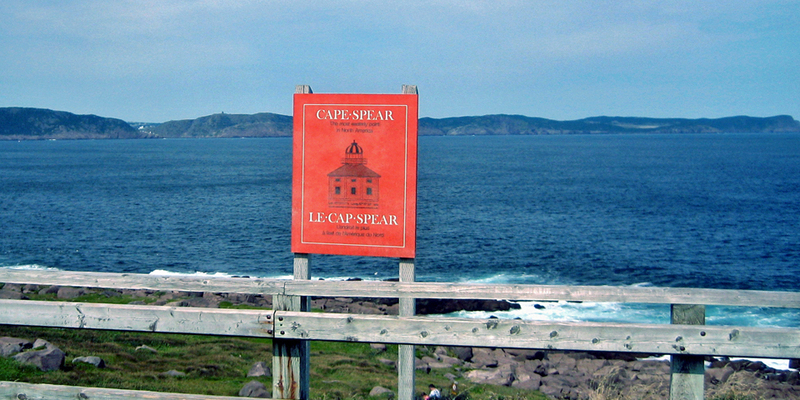 Remnants of Fort Cape Spear, a coastal defense battery, remain hidden from view. During World War 2, German U-boats approached, but saw just grass and rock. There was so little action that the Americans were reassigned to Europe. Hike a trail. Have a picnic. Pick blueberries and partridge berries. Mid-April is the best time to spot icebergs drifting from West Greenland’s glaciers. Stand on the windswept cliffs in spring or summer to spot spouting humpback whales or frolicking puffins. Or just listen to the waves pounding against the rocks. Our day in port was coming to a close. After a quick stop in picturesque Petty Harbor, where Orca and A Whale for the Killing were filmed, we returned to the Amsterdam. We ended our day with a brilliant final sunset at sea. We awoke to the sight of the Statue of Liberty as the sun rose over the New York skyline. Since boarding Holland America‘s Amsterdam in Copenhagen we had traveled 4594 nautical miles but had gathered immeasurable memories.